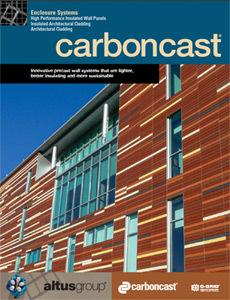 please click here to dowload a pdf of the CarbonCast Enclosure Systems brochure. 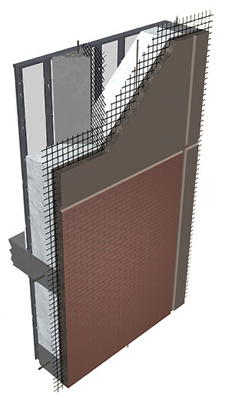 CarbonCast is an innovative technology that uses C-GRID¨ epoxy-coated carbon fiber composite grid for shear transfer and reinforcing in insulated precast wall panels. As a result, CarbonCast Enclosure Systems and can be lighter, stronger and more durable than comparable building systems. Depending on design, CarbonCast panels are priced competitively with other curtainwall systems such as brick-veneer, masonry, stud walls or concrete. And after factoring in reductions to superstructure requirements and potential HVAC system and operating savings, CarbonCast enclosure systems can help pay for themselves immediately. CarbonCast products are an innovation of AltusGroup, a partnership of the nation's leading precasters. Strescon Ltd. is a proud member of AltusGroup. CarbonCast Insulated Architectural Cladding features inner and outer wythes 1-3/4" thick and up (depending on reveal depth) for a total concrete thickness of 3-1/2" or 40% less concrete than a conventional solid precast panel. The wythes sandwich a layer of EPS or XPS continuous insulation; the thicker you specify the insulation layer, the higher the R-value. C-GRID® shear trusses connect the inner and outer wythes of concrete. CarbonCast Insulated Architectural Cladding can also incorporate C-GRID into the exterior face should concrete cover requirements - such as deep reveals - limit the use of welded wire mesh. CarbonCast Insulated Architectural Cladding is intended for horizontal and vertical placement as a non-load-bearing spandrel or column cover. It can also be used in a load-bearing stackwall configuration. An assortment of architectural elements such as cornices, bullnoses and reveals can be cast into CarbonCast Insulated Architectural Cladding carefully and cost-efficiently. Embedded finishes and veneers such as thin brick can also be used as well as simulated limestone or granite instead of extracted rock to further reduce raw material extraction. 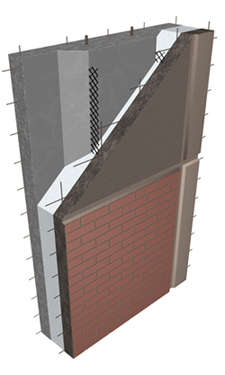 CarbonCast® High Performance Insulated Wall Panels deliver all the benefits of factory precasting with outstanding structural performance and insulating capabilities. C-GRID shear trusses connect the inner and outer wythes of concrete to render a thermally efficient exterior wall.